The curse of knowledge – knowing something and then not realizing that you have this knowledge – can make it difficult to remember the first time that you started learning about something. A great example of this is the Google developer documentation. Virtually every set of developer documentation that I have used and contributed to has been unique to the site or project that I have been working on and Google+ is no exception. This is not by design, writers spend hours, weeks, even months planning and mapping out how the documentation will be organized based on how the user will learn from it and how they will find the things that they are looking for. Documentation organization and information architecture are extremely difficult and no particular solution is best. In this blog post I’ll try and summarize a few key points of how you can use the Google+ developer documentation that I have learned from using it constantly. In case you have missed it, the Google+ Developer site is at https://developers.google.com/+. At the top, you have the most effective resources for getting started. These cover the “what is it” and “how do I see it work” topics. I’ll refer to this as the getting started section. Next, you have a breakdown of Google+ by feature and platform. I’ll just call this section features and platforms. Next, you have a breakdown of the developer resources that are quick references for the top resources that developers are looking for. I like to think of this as “get the stuff” but really it’s better summarized as Top Resources. Finally, you have the community updates and other broader information for Google+ developers. This is the external/community resource section for Google+. Given that breakdown, you can jump into each section with some sort of expectations and understanding for what you will encounter. I’ll now dive deeper into each section. 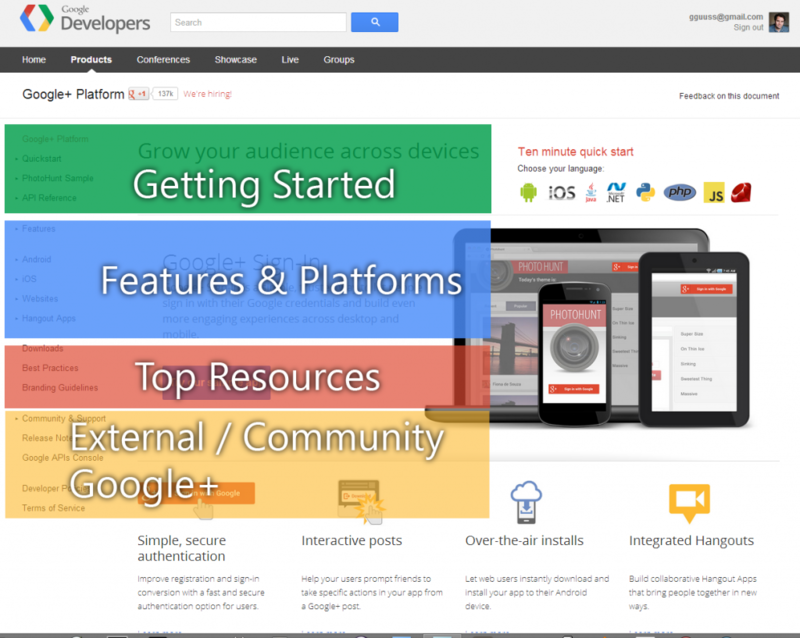 A quick platform overview for Google+. Getting started samples. We call these the quickstarts because they should get you going in around 10 minutes. These are broken down by platform / programming language (Android, iOS, Python, etc). The Photohunt sample. This is our showcase demo that brings together the features into something interesting and also demonstrates best practices for end-to-end applications built on Google+. The API reference that lets you understand the full capabilities of the Google+ API platform. When you dive into this content, you are typically looking to understand the platform overall and quickly get going. When you reach this content, it’s assumed that you want to experiment and explore by diving right into using the platform. Google+ features breakdown by capabilities. Here you can learn all about the core platform features of Google+. Sign-in, interactive posts, app activities, over-the-air installs, and so on. You can think of this section as a palette from which you can paint products. Each of these components is available and summarized for you to understand how it can work for you. Each of the sections contains code and examples ready to copy and paste. When you’re looking for a solution provided by the product / Google+ platform, this is where you go. When you want to see a feature and then jump in to understand how to use it, you can find everything right here. To discover the relevant content you can either dive right in to the platform that you are using, click through the visual content to the highlighted buttons on the top of the page. This section covers much of the “Get it now” contents and resources that can be shared with external folks you are working with. If you are looking for resources to point agencies to, these are the important ones. If you are looking to get the components for building apps, this is also where you should look. External and First party Google+ communities. We put our Google+ Developers Live videos here along with links to our Google+ community for Google+ Developers, our Google+ Developers page, our tag on Stack Overflow, and our official Google+ GitHub page. Release notes for enthusiasts and folks who need to track changes as they are released. Developer policies and terms of service so that you can be a good citizen in the Google+ ecosystem. When you are looking to maintain a deep understanding of Google+ and are getting to a more mature state with Google+ development, these sections are essential. You can connect with other people who are developing with Google+, can find resolutions to specific problems, and can learn the intricacies of how we want developers to use Google+. I know that most people reach our content through search. However, it can be really useful to get acquainted with the layout of our developer content so that you can also explore and discover the relevant content for your Google+ integration. The Google+ content team of writers has put immense amounts of effort into making our site as useful as possible for developers, take advantage of all the work they’ve put in! I’ll add a few more summaries to help you understand a few key things that you should look at and will reference over the course of your career as a Google+ developer. Please contribute to making the site better through the issue tracker and by telling the Google+ developer team what you think on the Google+ developers page. The feedback that goes through these channels really and truly shapes the future of the platform and the Google+ developer content. A final note, all of the latest Google+ features are being covered at Google IO this week. Follow the Google+ track either at the conference, at IO extended meetups, or online to learn all of the great new opportunities that are possible with Google+.